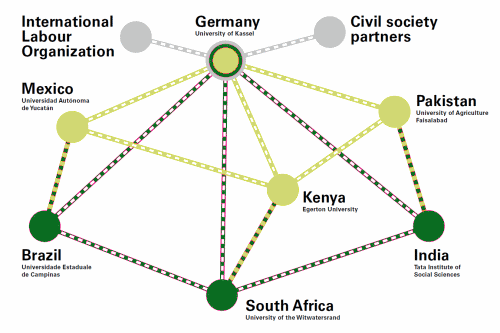 The International Center for Development and Decent Work (ICDD) of the University of Kassel is a global think tank network which contributes to the fight against global hunger and poverty through research and education. It is a cluster of excellence created by DAAD with five million euro funding spread over a period of five years to promote academic exchange between North-South and South-South. University of Agriculture, Faisalabad is a member of University of Kassel led ICDD with other members, one each from India, South Africa, Kenya, Brazil and Mexico. The funding includes MS and PhD scholarships, visiting lectureships, grants for collaborative research, scientific meetings and workshop for development and decent work in the partner universities. "Achieve full and productive employment and decent work for all, including women and young people“. © 2011 University of Agriculture, Faisalabad, Pakistan. All rights reserved.